Two years ago I couldn’t run a mile. I said this countless times as I headed down from San Francisco to San Diego for my fourth half marathon. To friends at work. To my uber driver to SFO. The guy at the Kiehl’s To-Go shop at the airport. A woman sitting next to me at the airport bar*. *no alcohol for me, just a grilled cheese please, I’m 5. It’s almost like I felt their admiration for what I’m about to do was unwarranted. Their response to “I’m running a half marathon,” was always an impressed one, typically coupled with “Wow, I wish I could do that!” And in return, I’d always say “No, no, I’m so slow, I’m not fast, I barely survive, I basically die, I’m not even a real person,” etc etc. And on top of that, it seems so much more expected and normal now that I’m a fitness writer full time. Of course I’m running a half marathon! But anyone who knew me just two short years ago knows how impossible this would have seemed… how distant and lofty of a goal it would be to even complete a mile without stopping to walk and catch my breath. Because I still feel so new to all of this, part of me feels undeserving of the praise (which is messed up in its own way). I’m not fast, I’m likely never going to qualify for Boston (that’s an actual LOL to me), and although I’ve completed three of these bad boys, I still feel like a flailing whirlwind of ineptitude in a pair of Nike sneakers. I still don’t feel like “a runner.” Not sure why I keep denying my abilities, or why I put this weird standard on myself, to which I’ll likely never amount. The other part of me feels just the opposite — more accomplished than I have ever felt in my entire life. The feeling of crossing the finish line during my very first race was a moment of elation I’ll never be able to put into words. The fact that I’ve done it more than once is surreal. I know now I’m exactly where I should be, and strong in how far I’ve come. I don’t need to be a Boston qualifier to be a “real runner.” I’m a runner because I run (no matter the pace) and because I keep trying to be better. And I want other people — people like me two years ago — to know they can have this feeling, too. And now here I am, somewhere along my running journey — a journey that opened up an entire world of fitness, and turned my life around. Without running, I never would’ve found cross training, yoga, or the passion and love of exercise that saved my mental health, and led me to a new job, a new city, and a new chapter of life. Today, I’m preparing for my fourth half marathon, thanks to a brand I love and a lifestyle I’ve created for myself. I literally started from the bottom (the bottom being the Valley Middle School track, completely winded, defeated, agonized, and trudging along at a 15-to-16-minute-mile pace), now I’m here. Now the whole team Suja here! Sorry, I’ll stop. “Here” is a lovely hotel at the San Diego harbor, awaiting a race in the sunshine. #blessed. My training this go around is nearly unrecognizable compared to my training schedule for previous races; the variety and amount of exercise I’ve included into the past few months has been exponentially greater than the last three programs. I’ve actually run less (perhaps not my greatest of moves, but it’s chill), but included more cardio (hi, SoulCycle), strength training and conditioning, and restoration (rolling, massages, etc). Another facet has been nutrition, and stress relief. 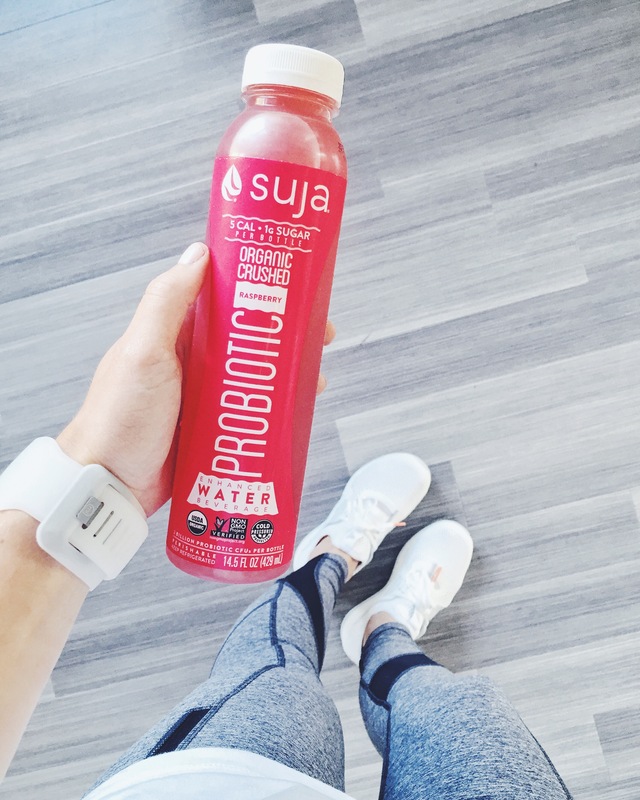 I’ve added probiotics into my diet, via kombucha, Suja probiotic water, and kefir. I’ve been making smoothies regularly, and have added a large breakfast almost daily into my diet. I’ve been loading up on the liquid chill pill that is Lavenade (possibly my favorite drink ever), and focusing on keeping myself de-stressed, calm, and centered (if you saw anything about my very first half marathon, you know how panicked and anxious I was!). I feel better than ever. My body and mind are in the best shape they’ve ever been, and I wouldn’t be here without this new found love for (and borderline obsession with) fitness, the support of Suja, the encouragement from friends and family, and the incredible camaraderie of my partner in crime, Arielle, who will be running alongside with me again tomorrow. Here’s what I’ll be listening to… a lot of indie electronic (obsessed with Jai Wolf) and electropop with a dash of Bieber and my favorite Mariah song. See you out there on the course. We’re headed to Cafe Gratitude and the Race Expo now! And if you’ve yet to try running… or any kind of fitness!… and this sparked even the tiniest of stirrings within you — please, do me a favor, and go change your life. If I can do it, anyone can. So so proud of you love!